The penultimate stop on USAU's Vision Tour drew one of the largest crowds so far to discuss priorities for the organization's next strategic plan. Attendees rank priorities for USAU’s next strategic plan at NY Vision Tour stop. Photo courtesy of @BentUltimateNYC on Twitter. This article was written by guest author Jim Leppert. On a rainy Tuesday in Brooklyn, over 90 local ultimate players shuffled into the chapel of Packer Collegiate Institute to meet with USA Ultimate as part of the 2017 Vision Tour. Attendees represented coaches, players, and organizers from all levels of the sport: high school and YCC, college, club, semi-pro, and recreational players packed into the pews. The event, organized by DiscNY, was one of the last stops on the larger 11-city series of USAU meetings about the future of the sport. As USAU’s Stacey Waldrup took the stage to begin the night, she made clear that these events and the surveys that will follow will guide the governing body through the next five years. Stacey was soon joined on stage by USAU Board Members Michael Eck and Steve Mooney, as well as USAU staff members Andy Lee, Josh Murphy, and Tom Crawford. The first portion of the night was dedicated to a talk by NY Bent’s Brittany Kaplan discussing equity, and she highlighted the role this piece by Chip Chang played in making this portion of the night happen. First, Kaplan mentioned that New York had already held a Food, Feminism, and Frisbee event and that many of the players attending the Vision Tour had also been at that event. Her lecture centered around what equity meant and what could make ultimate a more equitable sport, providing questions and starting points for the discussions that would drive the majority of the event. Kaplan stressed that all identities had to be discussed in regards to ultimate — not just gender — and that while important to work on, success in equity isn’t easily achieved. But, Kaplan said, there will be no solutions if people — if those involved in ultimate — are not educated. Following Kaplan’s lecture, the attendees separated into five groups for breakout discussions on equity in ultimate. Starting points in these sessions were provided by both USAU and the breakout ‘leaders’ that volunteered with DiscNY in the form of questions. 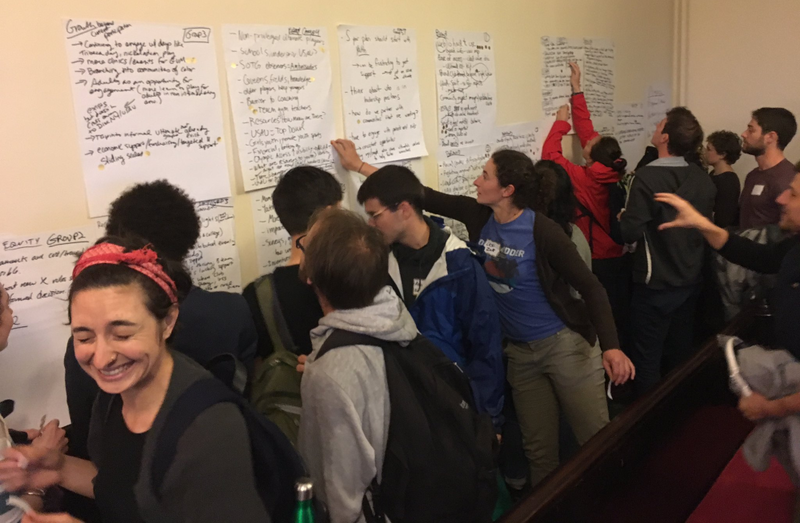 From USAU, the focus was more on what the organization could tangibly do, while the volunteers brought questions focused on the depths of equity. The common thread among all five of the groups was that youth ultimate was an important aspect in not only growing ultimate but growing equity in ultimate. The groups brought up that entry into ultimate in college (or later) is often a barrier for those participating (or simply too late to get them invested in the sport) and that an emphasis on elite play from USAU may take away valuable resources from creating a stronger youth base. One of the groups focused particularly on a person’s opportunity to play ultimate — based on gender, economic status, and opportunity to seek a higher education. Even at the youth level, opportunity — especially in New York City — is limited to a potential player’s location, field space limitations, and resources available to both the player and organizers. Reaching out to the less privileged, creating more representation at the leadership levels of the sport, providing incentives for youth ambassadors, and adding emphasis on teaching Spirit of the Game and observer skills at the youth and college levels were also discussed extensively. For the next portion of the event, USAU CEO Tom Crawford delivered a talk titled “The World of Amateur Sports,” though he quickly said that it was more about how USAU and WFDF are advancing ultimate. To clarify, he stated advancing ultimate is the mission of USAU, while the organization’s vision is that ultimate is a sport that inspires athletic excellence and integrity in all. Each drives and informs the other. He began his presentation with an image of a pyramid that included USAU, the Olympics, and even the local teams. Starting from the top, the Olympics build sports infrastructure internationally. The next layer down contains WFDF, which is looking to get the IOC to invest in ultimate, and the US Olympic Committee, which acts as the ministry of sport in the USA and opens up USAU to partnership with other sport organizations like USA Football, USA Soccer, the YMCA, and the Police Athletic Leagues. Speaking of the Police Athletic Leagues, ultimate is slated to be announced as their signature sport at an upcoming conference, which Crawford said would be a big step in exposing more children across the country to the game. Next in the pyramid came USAU and Crawford was quick to admit that college makes up the largest percentage of the 55,000+ members to USAU, while other sports such as lacrosse or swimming have their base in youth. He stressed that coaches and volunteers are extremely important, along with organizations and initiatives that the USA Ultimate Foundation funds like GUM and Play it Forward. State-based organizations are becoming a focus for USAU staff as well. At the bottom of the pyramid were a mix of the local organizations (where USAU is looking to push more resources for growth), programs like GUM, and teams like BENT or PoNY. He said that USAU is working to increase local control of events, with the goal being not only to increase the quality but also to bring revenue back into the local organizations. There were then more breakout sessions, each with a different topic: branding, youth, semi-pro, and the Olympics. Afterwards, each group’s USAU representative came in front of the group and quickly discussed some key takeaways from the small group discussions. The branding session talked through the hard-to-use and often confusing USAU website that is only made more complicated to the recreational or non-elite level player due to the focus on the Triple Crown Tour in the current branding. The group also discussed how a branding based on equity can help USA Ultimate’s growth. For the youth group, there were a few local youth players and coaches that were able to participate. It was said multiple times that while a lot of people in attendance love playing ultimate, they do need to start coaching as well in order to help the growth of the game. The group came to the conclusion that youth should, as a whole, emphasize spirit over athleticism. The semi-pro group and Olympic group were some of the most lively discussions inside the chapel. The semi-pro group immediately acknowledged it as “an obviously difficult topic… with not easy issues.” There was a lot of discussion in the group about how the American Ultimate Disc League doesn’t provide an opportunity for women, but that the AUDL still does bring exposure to the game. From the Olympics group, Dr. Crawford stressed that USAU doesn’t decide if becoming part of the Olympic program is a goal for the sport of ultimate — that decision lies with WFDF. Within WFDF, he said, there is overwhelming support for that to be the goal for ultimate to achieve. Crawford made a point to stress that the relationships with outside youth organizations come about through Olympic partnership. He also stressed that the Olympics provide a monetary incentive to WFDF and its member nations to fund more developmental programs around the world. The night ended with an abbreviated Q&A session with USA Ultimate staff, with Dr. Crawford answering all of the questions asked by the audience. The first question asked what, from the USAU perspective, could be done to open the door to a partnership with the AUDL. Crawford said that the organization was concerned that the AUDL’s version of the sport exposes people to a male-only, referee-based version of the sport. He did say that the AUDL was doing a good job marketing ultimate, but that it was still marketing a male, reffed sport. Crawford continued that using observers instead would make a big difference, as would the AUDL working actively to raise the profile of women; opportunities for partnership were still possible because of the AUDL’s marketing and resources. He also made sure to point out that as a member of WFDF, when the semi-pro leagues came about, other countries were strongly against this idea of a semi-professional league. Later in the Q&A sessions, Crawford was asked what held USAU back from strongly disavowing the semi-professional leagues as some WFDF member-nations pressured them to do. “It’s the United States,” Crawford said. He would go on to say that it didn’t feel like the right thing to do and that if someone wanted to pour their capital into it, USAU didn’t feel that it was their place to tell them not to. Next, Crawford was asked about a possible NCAA & NJCAA partnership with USA Ultimate, because the two organizations appeared on a slide during Crawford’s earlier lecture as a future target for partnership. Being extremely careful with his words, Crawford said that due to the current nature of sports, the NCAA could implode. But, he said, that if ultimate is added to the Olympic program as an emerging sport,1 the US Olympic Committee will go to the NCAA with a plan to make ultimate the next women’s emerging sport on the collegiate level because the USOC love the values of the sport. He said that it would be a strong proposal because of ultimate’s exploding growth, how inexpensive it would be to add, how fun and competitive the game is, and that it serves as an additional sport to meet Title IX requirements. After an earlier discussion on how to reach those who weren’t in attendance, Crawford was asked about when the next event would be and how USAU planned to listen to the feedback generated across the tour. The first step he said was to look at the data generated during these discussions and consolidate it. Next, USAU would issue follow-up polls online to reach those who weren’t represented at these discussions — with the polls shaped by the data. Unfortunately, he wasn’t able to say when USAU would next be able to meet face-to-face, mostly due to the busy travel season that the staff would soon have. But, he said, there was perhaps an opportunity for the state organizations that USAU has been working hard to establish to be leveraged into creating more opportunities overall. Lastly, an audience member asked why USAU hadn’t focused more on the mixed divisions across all levels of play. Crawford immediately said that this question, or some variation, had been consistently asked city to city so far on their tour. He did say that when it came to elevating the mixed division, “I’ll bet you’ll see us do more,” and that a mixed league does have appeal to him personally. But a USAU-based professional league is a question of capital that isn’t available. He said that he “would bet that the AUDL is losing loads of money” and that maybe the sport as a whole is getting ahead of itself. That the sport first has to grow to a scale that makes pro leagues viable. To end the night, attendees were asked to place a gold sticker next to one of the ideas or topics discussed that felt to them should be the organization’s top priority. This is one of the ways USAU is collecting data from the events on what those in attendance deem important. Be sure to check out New York BENT on Twitter (@BentUltimateNYC) for pictures from the night and a big thank you to DiscNY for organizing the event, particularly with the weather issues that postponed the event. Comments on "Equity, Semi-Pro Leagues Among Major Topics Of Discussion At NY Vision Tour Stop"